Search Results for "doctor talks to mother"
1950s: Dining room, doctor talks to mother and teenage boy, picks up bag. Mother walks out with doctor. Boy sits down at table, folds hands. 1950s: Teenage boy listens carefully, looks incredulous, asks question. Living room, doctor talks to mother and teenage boy. Mother looks concerned, smiles cautiously. 1950s: Dining room, doctor talks to mother and teenage boy, looks stern, nods. 1950s: Boy talks with friend. Little girl joins group. Boy leaves. Doctor talks to nurse. Mother and son go into room with doctor. Nurse smiles. Doctor closes door and listens to boy. Cute Little Girl Visits Friendly Doctor with Her Mother. Doctor Talks with them and Uses Digital Tablet Computer. Healthy Child and Modern Health Care Service. Shot on RED EPIC-W 8K Helium Cinema Camera. 1950s: Dining room, doctor talks, knits eyebrows, looks concerned, nods. Mother talks, teenage boy looks incredulous, asks question. Doctor answers. 1950s: Dining room, teenage boy blinks, looks incredulous, asks question. Doctor looks serious, talks, nods. Mother talks, looks concerned. 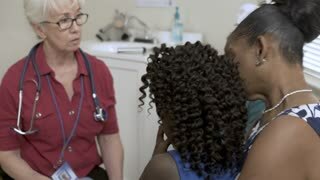 Close-up of a mother with a small daughter at a doctor's appointment, the child plays with a small flashlight while the mother talks to the doctor. In the Hospital, Pregnant Woman Getting Sonogram / Ultrasound Screening / Scan, Obstetrician Checks Picture of the Healthy Baby on the Computer Screen. Doctor Talks with Happy Future Mother. Shot on RED EPIC-W 8K Helium Cinema Camera. 1950s: Dining room, doctor talks, pulls up chair, sits. Mother also sits at table. Teenage boy stands, talks. 1950s: Dining room, doctor talks confidently, takes off stethoscope, nods. Mother shakes her head, raises eyebrows, looks concerned, nods, talks. Friendly Doctor Does Routine Examination of a Sweet Little Girl who Came with Her Mother. Pediatrician Talks to Both of them. Doctor's Office is Bright and Modern. Shot on RED EPIC-W 8K Helium Cinema Camera. At Doctor's Office. Well Natured Male Doctor Talks and Jokes with Little Boy and His Mother. Recovering Little Girl Lies on a Bed In the Hospital, Talks to a Friendly Doctor With Clipboard, Mother Sits Beside. Cute Child is Taken Care of in the Modern Pediatric/ Children Ward. Shot on RED EPIC-W 8K Helium Cinema Camera. A woman doctor talks to a little boy who sits in the arms of her mother, she gently holds the child's hand. The child is afraid of the doctor. Pediatrics. Family doctor. Friendly Medical Doctor Talks With Sweet Little Girl who came With Her Mother for an Appointment. Healthy Child With Happa Parent. Health Care Working. Shot on RED EPIC-W 8K Helium Cinema Camera. Mother with Sweet Little Girl Visit Friendly Pediatrician. Doctor Talks to Them after Thorough Examination. Brightand Modern Medical Office. Shot on RED EPIC-W 8K Helium Cinema Camera. 1950s: Mother and son enter doctor's waiting room. 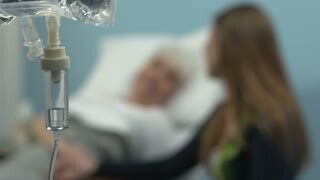 Woman talks to nurse. Pencil points at appointment book and clock. Boy hands coat and hat to woman. Woman hangs items on rack. Boy sits. 1950s: Dining room, teenage boy stands, looks concerned, talks. Mother in apron looks concerned, arms crossed, puts hand to face. Doctor enters room, talks. 1960s: Mother hugs daughter. Father walks behind desk, talks to doctor. People sit in waiting room. Man hands file to other man, men shake hands. Man stamps closed onto file. Mother with Sweet Little Girl Visit Friendly Pediatrician. Scared Child Talks about Fear of Needles but Professional Doctor Calms Her Down. Brightand Modern Medical Office. Shot on RED EPIC-W 8K Helium Cinema Camera. UNITED STATES 1950s: Woman talks to doctor / Doctor speaks / Woman, doctor in foreground / Doctor speaks / Close up of woman. 1950s: Doctor uses tongue depressor to look in boy's mouth. Mother watches. Boy sits. Doctor speaks and opens door. Woman hands boy coat. People leave. Boy waves and puts on coat. UNITED STATES 1950s: Close up of boy / Hand holds doctor bag / Woman talks to doctor / Close up of boy / Boy walks / Boy next to house. Beautiful young mother and her little son at the pediatrician. Portrait of a young pediatrician with glasses, she talks with her mother and a little boy in a children's hospital. Beautiful young mother and her little daughter at the pediatrician. 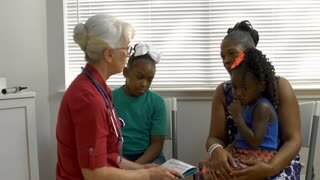 Portrait of a young pediatrician with glasses, she talks with her mother and a little girl in a children's hospital. 1960s: UNITED STATES: doctor talks to relatives in corridor of hospital. Police officers speak to doctor at hospital. United States: 1960s: lady holds hand of boy on hospital trolley. Doctor sees boy. Doctor talks to lady. UNITED STATES 1950s: Boy approaches woman and doctor, doctor pats boy's head / Woman talks to boy / Woman and boy / Close up of woman. 1960s: Blurry chandelier. Snowy forest. Boy and mother speak. Doctor and father listen. 1960s: UNITED STATES: doctor talks to police officers in corridor. Close up of man's face.